Big surprise here as Roger has accepted a wildcard into Monte Carlo. Having not played the tournament since 2011 I am surprised he's decided to do so this year. The tournament always keeps a wildcard available to him until the last minute but usually he never takes it. The question I have does he know he's going to be missing Madrid or Rome because of the new baby or is he playing for ranking points / clay tune up? I would have thought the last thing he needs would be a long hard slog on some of the slowest clay going but he's obviously feeling sharp physically. I've never been a huge fan of Monte Carlo as a tournament ever since my flight to go watch the final there was cancelled due to Eyjafjallajökull erupting. The only saving grace was I only missed Nadal destroy Verdasco in possibly the most one sided Masters 1000 final ever. It was painful to watch. It's not been a happy hunting ground in recent times for Roger either losing to both Wawrinka and Melzer the last 2 times he's played it. I probably think he's playing it because Madrid or Rome might be touch and go as to whether he plays it. Mirka is looking larger by the day so I'm sure she must be due late April / early May so by playing here he could probably stand a very good chance of being the 4th seed come Wimbledon. The field is quite strong so it's going to be a test for Fed as both Djokovic and Nadal are in the draw. Murray is missing but he's a clay mug as we witnessed at the Davis Cup vs Fognini so I doubt he would have factored. I'd imagine Roger will make the Quarters or Semi Finals depending on the draw and then it's a bit of an unknown. I will of course be watching and live chat will be running for all his matches. What do you guys think? Why has Fed decided to play Mickey Carlo? I can’t find any place where it says Roger has accepted a wild card. Are you sure about this news Jonathan ? The ATP website is reporting it, but we’ll see later if it’s true. I only report facts 🙂 why go anywhere else? This is a pleasing surprise. I have interpreted Federer’s reluctance to play Monte Carlo as his giving up defeating Nadal on this slowest surfaces. For Federer had lost to Nadal at the final for three consecutive years. I think Federer is more confident and willing to winning the French Open this year. How you know if Roger had a reluctance to play Monte Carlo? His decisions to play certain tournaments based on Nadal is ridiculous. Well he obviously had a reluctance to play it as he hasn’t played it since 2011. As for a reason who knows – not a fan of the area, doesn’t prioritise it etc etc. Could be anything. Big surprise but I haven’t seen this anywhere. He said in a Davis Cup interview that he had 4 weeks off and then Madrid-that was just over the weekend. I think he wants to climb up the rankings fast, because in his mind he must feel at least the number 3 player in the world right now (and I don’t see Stan holding it for much longer – Berdych continues to come strong, too). Hopefully Roger will be fit and ready to go in the bigger tournaments… that’s my only personal worry, because in my mind a good Roland Garros result is the best way to prepare himself for Wimbledon. I dunno about that, playing well at RG hasn’t always guaranteed success at Wimbledon. 2012 he was poor at RG but won Wimbledon. 2011 he made the final at RG then lost QF Wimbledon. I think his year so far he is set up well to do well on grass as he’s feeling confident based on 6 months of solid play irrespective of how he does at the French. Confident play on grass is a must. I had a feeling he would play MC this year based on the confidence with which he’s been playing this year. I mean, why skip a major or 1000 when you’re on a roll? The ranking points don’t hurt either. You have good point about the timing of the real baby Fed’s arrival. Might be the biggest reason of them all. This is great news for sure, but I don’t think he’s doing it for the rankings I think he’s doing it because he knows the baby or babies 😉 is due either when Madrid or Rome is played, so now he’s sure to get some clay matches before Roland Garros. Or maybe he needs a new Rolex watch? I hate MC too, ever since Borg made a disastrous comeback there still playing with a wooden raquet! A sad occasion. Bizarre that Roger has decided to play it though. I think you could be right Jonathan that it may be more to do with coming family events than anything else. Well at least it means we don’t have such a long famine to live through. Yep, as I tweeted I am surprised! But think you r right Jonathan, it must hv to do with baby timing! Can’t really think it is ranking based so can only conclude he may hv to miss Rome?? Delighted to be seeing him in action again so soon and just hope he gets a favourable draw!! No Murray which does actually surprise me as he really needs some points, and some practice on clay! Good scoop Jonathan and can’t wait for yr posts! What an extra treat!! I think he will miss Madrid! But just guessing. Slightly surprising, but like you said it might have something to do with his new baby, Roger may even end up missing Madrid and/or Rome. That wouldn’t surprise me. The best thing about Mickey Carlo is the location by the sea. Naples looked good too for the Italian Davis Cup vs GB, Although maybe it’s a little bit pretentious in MC. I imagine everyone wants to be Roger’s best friend there but he will be used to that wherever he goes. 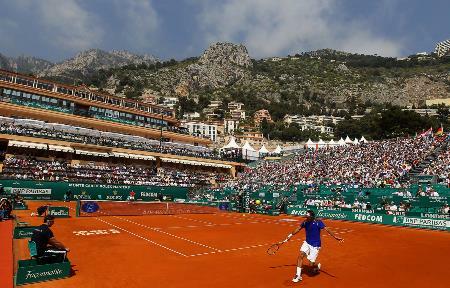 I will admit that Monte Carlo looks like a beautiful place. Interesting. I agree, Madrid and/or Rome might be missed. I do love the setting of MC though. Holding a wild card for Fed every year just shows the man’s popularity throughout the world. Djokovic’s half of the draw? Sue, was interested to notice someone post a photo on Twitter of a recent edition of a Spanish-language tennis magazine – “Grip”, from Argentina – with Federer on the cover & the headline “everyone’s favorite”. It’s amazing, even in Delpo country! But if it IS true, hey, I’m happy. Agree it gives him more flexibility with potential baby conflicts later in the month. Also agree practice on slow stuff isn’t necessarily a bad idea – maybe he has some ideas about what he could have done at night in Miami – possibly racquet-settings-wise – & wants to try them out. Nope, Carole Bouchard of l’equipe.fr had it first. Maybe there was a language delay… though I still find it hard to believe Monte Carlo wouldn’t tweet their own coup. Although now notice they have at least 3 different accounts, some of which are clearly no longer in use; maybe social media isn’t their forte. Hey I like that reasoning too as the racquet is totally unproven on slow clay! Last yr he was still tinkering and still injured! Interesting interview he gave yesterday saying he still has aims for a Major this yr so the ambition clearly stated! Babies? Racquets? Rankings? All three? Just excited to see him playing! Hoping for semis at least!! I too assume it’s something to do with the baby due date. I suppose it’s conceivable that the doctors could have revised their estimate forwards. I’m a bit surprised he’s missing his training block, or perhaps he’s just moved that on a bit. Thinker’s got a point that there might be a connection with the racquet too: if he tries it this week and decides that it needs a bit of tweaking for clay, there’s time to do something about it before the serious stuff comes along. Oh, and I can’t believe people believed that about the July due date, anyway. I may not be hugely experienced in the matter, but even I said when the report came out that there was no way July was feasible to judge by Mirka’s size at the time. Its surprise Roger is taking wild card for MC, which is pretty slow. As u mentioned reason might be Mirka’s delivery . I hate clay swing. Hope Roger does well. Yeah clay worst part of year but usually some memorable matches along the way which improves it. I think most matches are pretty dull but sometimes one can catch fire. eBay is your best bet, none of the major retailers hold stock of old shirts as they are just taking up valuable space that can be used for newer stuff that is selling in droves. As soon as hearing Jonathan’s tweet, I tried to get a ticket last night since I live less than an hour away. But all gone already! Oh Roger are you kidding me? MC Site is saying they have reserved a certain number for direct sale at the ticket booth on the day – though not what that certain number is. I think they sell fast, when I was going in 2010 I bought them in January I think and already a few had sold. I have a feeling he will win MC and Rome this year (if he plays those). But I do think Roger is playing MC to gain points. Maybe he wants the nr 3 spot. Maybe he thinks he can “push” Stan from that because of the way Stan is playing. And maybe, like you all say, he wants to get the practise because he knows he will miss one or two tours because of the due date. My only worry is that he will be too tired. Roger is not young anymore and I did see him gasping for air like three times (don’t know if I called it right, but he was blowing air???) during the Golubev match…. What a news! I was just checking ATPWorldTour web site to find something interesting relating to tennis, then I’ve got this! Fans there are going crazy too. It will be a very good strategy for Roger that he will pick up as many points as possible to reinforce his No 4 position when going into the remaining three slams. I’m sure he will, coming in off winning a decisive 5th rubber for the first time in his career. Mickey Carlo not been a great tournament for him though, he lost to Gasquet, Stan and Melzer! I hope he gets a very weak draw, infact I have amped up my prayers for that as I do not want him to stress himself at all. Nice spot Utch! Sounds like it’s for real! Doubtful, probably not played since winning on Sunday. After watching Fed win Dubai, RU in IW and lose a winning match in Miami I was a little despondent having to wait a while to watch him play. So I don’t care why he is playing as long as he is playing. From a strategy perspective, Fed knows best and I am sure that this is a well thought out move and though I hate clay ( excepting when its blue !! ) I guess here we come – Monte Carlo. Go Fed Go. You guys are still whining about Miami? You need to grow up. Roger is not going win all his matches. Hating clay because of Nadal doesn’t help either. Roger has won Madrid when it was red clay. He never said he hated clay because of Nadal. You inferred that. Clay is a surface that plays incredibly slow and favours the baseline grinders over the shotmakers. While it’s true Nadal belongs to the former of those, it doesn’t mean hating baseline grinders means specifically hating Nadal. Some people just enjoy good tennis. And clay less often provides that, I’d say. Nah….Nice try. Just like Nadal fans don’t like surfaces that don’t suit him. Cincinnati and WTF. Federer has has won both multiple times. His game is improving and he doesn’t need that much of a break. Kei accident was due to work overload but that is over now so he should manage to go deep in another 1000 tournament. Very reasonable and such a pleasant surprise for all tennis fans, making MC much more interesting than without the GOAT. I imagine organizers should be delighted too. I also have the feeling he wont skip Madrid or Rome. John, you hit the nail on the head when you say that clay favours the baseliners instead of the shotmakers because of its slowness. This allows guys like Nadal and Djokovic to play 20 – 25 shot rallies till one of them hits out or dumps it into the net. Hardly tennis. I remember ridiculous matches between Lendl & Wilander in FO. Unfortunately, all surfaces have become slower and thus skill has taken a backseat. Having watched Dubai Open live for the past few years, I must say its great watching there not only for the ambience but the surface I daresay is the fastest and thus you see awesome shotmaking and needless to add Fed has won it so many times and Nadal doesn’t turn up. Coincidence or what ? I don’t mind clay in small doses, it’s just when matches drag and drag. But this tends to happen on all surfaces nowadays. Very surprised to hear Roger taking wildcard at MC, not bad strategy actually. He has a decent shot going deep and keeping Birdshit at arm’s length. Good for us fans not having to endure 4 weeks absence, I pray for favorable draw. Djoker / Fed semi is the draw. When will the draw come out? The MC site says Saturday, noon local time. That must be…. 11am Jonathan’s time? 6 or 7 am US East Coast time? Most probably because of family matters while trying to maintain the 4th ATP ranking spot for RG. Skipping Rome or going out early perhaps, to recharge. It could also be to try out how the new racquet plays at the top level on clay. Playing Monte Carlo could give him time to do adjustments before RG, who knows. He hasn’t played with this racquet any matches on clay (as far as I know). Hamburg was quite some time ago and a slightly different racquet I believe. I really don’t know why many Fed fans don’t enjoy Rogers clay game. Maybe I got that all wrong. Roger is beautiful on clay. The 2011 semi final against Djokovic is one of the best clay matches I have seen. Sure, Nadal gets to him but he does that on practically every surface nowadays. I totally agree with you! I absolutely love watching Roger on clay. The artistry and creativeness of his game is highlighted on the dirt, not to mention the fact that he is a beautiful mover on the surface. Obviously Rafa being the best clay courter ever and being a thorn in his side on this surface (and really all surfaces) can leave Fed fans with a bitter taste, but purely from a watchability perspective, I don’t get it how people are hating on the clay. Yeah no clay matches as of yet with this new racquet, just the purple stuff in Slowami. I enjoy watching Fed on clay, he is a good mover on this surface and played some of his best matches on it too. FO 4th Round 2009 vs Haas was quality and the 2011 semi final you mentioned. But in general clay court is the most boring to watch IMO when it gets into grinding and grinding. It is good for seeing a players technique though. Henman was good to watch on clay as he tried to end points quick. Sure, Nadul vs. Novak on clay, not so fun, but Rog vs. anybody but Nadul, quite enjoyable. Occasionally, epic. I find that Roger plays Naduls game on clay but maybe that’s because Nadul forces him to. Vs the rest of the gang, there will be drop shots and angles but not vs Nadul. To sad. I’ve been fantasising lately that this year Roger will have a big one over Nadull at one of main clay court tourneys, when Nadull feels that he could repeat the same result 🙂 . As days go by and clay tourneys get closer, I become more convinced. I, too, feel that Roger plays great on clay and agree with Jarlub that I’ve never seen Roger played so well in that semi-final match against Nole in 2011 RG 🙂 🙂 🙂 . I’ve since watched it a few more times on Youtube. Any performance closer to that, my dream could come true 🙂 . I call BS. When you click on the link, no information can be found and also I can’t found any news of this withdraw anywhere. You’re right, I don’t see it any more. It was there when I first happened upon it. They probably posted it based on a rumor and have removed it when it proved false. Joydeep was right though, they did publish it. He already twitted that was nervously watching. Did they lose? Are they out? Me too! Also expecting Fabio Fognini to break thru on clay over next 4/5 weeks! Things cld get interesting! Fognini should make 2nd week at French Open providing he’s fit. It’s taken from the Davis Cup blog post where Simon and Rita put down their experience watching live. Karma has turned against the bolo-whipper. Fed is in MC! First practise today! Posted another dorky tweet (love it) showing his socks red with clay declaring his passion for the red stuff! Let’s hope it loves him back! Is Edberg joining him?? Hope so! All much easier now as big European swing!! Why did he need a wild card? Did he say he wasn’t coming previously or something?